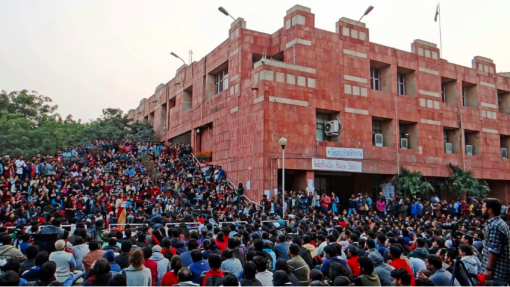 The story of JNU’s destruction is a story about how one of the country’s premier universities is being systematically targeted and destroyed as part of a larger agenda of privatisation that will put an end to all that a University stands for. “The proposal to replace the UGC with a new regulatory body, the Higher Education Commission of India (HECI), the setting up of Higher Education Funding Agency (HEFA), the Graded Autonomy Scheme and the Creation of a special class of ‘Institutions of Eminence’ are indicative of a movement towards a combination of greater government control and interference in Universities as well as greater privatisation of higher education,” a JNUTA member said in a statement issued by them. As per the notification for the referendum, the voting process will start at 10 a.m. and continue till 5.30 p.m. on 7th August 2018 and the venue will be the Satyagraha Square (in front of the main library entrance). In the recently concluded ‘Convention on Higher Education’ held on August 3-4 in the national capital, in addition to teachers and activists, Mohammed Salim (Communist Party of India- Marxist), D. Raja (Communist Party of India), Udit Raj (National Chairperson of All-India Confederation of SC/ST Organisations), former BJP leader Yashwant Sinha and leaders of other opposition parties spoke about the privatisation and centralisation of higher education being pushed by the current BJP government, and also about the continued attacks on JNU as a space for debate and dissent. The acceptance of a Rs. 515 crore loan from HEFA, mandatory attendance for all students, introducing biometric attendance for teachers, drafting of an Intellectual Property Rights policy which proposed to take copyright control over all work created by stakeholders, repeated violation of JNU’s statutory provisions and obligations, undermining the integrity of the faculty selection process, implementing seat cuts, violating the reservation policy, the illegal dismantling of the Gender Sensitisation Committee Against Sexual Harassment (GSCASH), and the callous attitude displayed by the JNU Administration towards the disappearance of a student, Najeeb Ahmed. Students and teachers have been continuously protesting against the highly authoritarian, opaque and top-down decision-making process which has been centralised in the hands of the Vice-Chancellor of JNU, M. Jagadesh Kumar, and against the end of all democratic and consultative processes, like the meetings of the Academic Council (AC) and Executive Council (EC), which were the founding principles of the University. Accordingly, this cycle of protests by the teachers’ association began with a one-day teachers’ strike on 31st July 2018.